Bake one layer of an 8 inch round cake. Next I baked a round ball cake. I used the Wilton ball pan. It consists of two half balls that you will eventually put together. Using a white icing ice the 8 inch round layer ,making sure it is nice and smooth .Next make a royal blue icing and use the star tip # 16 to make double lines together on the sides of the cake, spacing your double lines equally around the sides. Use the star tip # 18 and make a shell border around the top and bottom edge of the sides using white icing. Now take the two half balls and put them together with the white icing. Slice off a small amount of cake off the bottom of the ball so that it will sit level. Place the ball on the top center of the round decorated layer, flat side down. Use white icing and the star tip #16 and cover the entire surface of the ball cake. Make a red icing and use the round tip #4 and make the lines and the stitches on the ball. If you have made a Baseball cake for a birthday or other occasion that you would like to share, please submit your cake here and let us know how you made it! We would love to feature your cake on our site. Please make sure to include a photo of your cake and a description of how you made it, so that we can all share ideas and learn from each other! 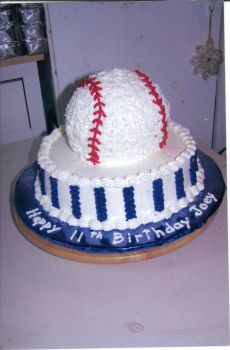 See Baseball Cakes That Were Submitted By Others To This Site!